Posted January 2, 2017 by admin & filed under Family Dental Care, General Dentistry, Teeth Care. The holidays are a time of gatherings with family and friends. It’s also a time for eating all kinds of gooey, sticky, sweet, crunchy foods and often drinking holiday cocktails, eggnogs, wines and spirits. While all of these taste great, they can cause problems for our teeth. 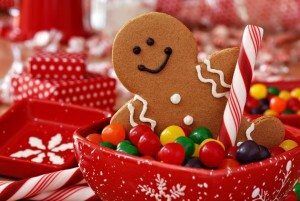 As you indulge in candies, pies, cookies, caramels and nuts, remember anything that lingers in your mouth can be great fodder for gingivitis, tooth decay and cavities. Also, be careful chewing nuts and hard candies. Biting down on these items can sometimes chip a tooth, loosen a crown or dislodge a bridge. Creamy, thick eggnogs also can leave a filmy residue on your teeth which means that the sugars can have more time to work on your teeth and gums. Added alcohol also reduces the teeth and mouth-cleansing saliva. 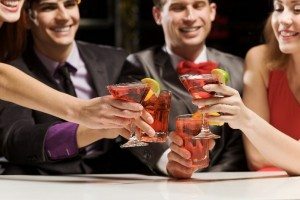 As you toast the New Year, or celebrate with family and friends, be sure to take extra care of your teeth. From time to time, drink some water and swish away those sugary coatings. Consider eating some more carrots or celery as healthy snacks. These foods actually increase saliva and can clean teeth as you chew. Keep up your brushing and flossing two times a day. And when you’re snacking on all of those tasty foods, you should boost this regimen and add another brushing and flossing step to your day when you’re done. Be sure to schedule your next dental evaluation in the New Year at Modern Family Dental Care.